SASEBO, Japan - The Bonhomme Richard Amphibious Ready Group (ARG) completed its patrol of the U.S. 7th Fleet area of operations, Sept. 3. During the underway, the Bonhomme Richard ARG, which comprises amphibious assault ship USS Bonhomme Richard (LHD 6), amphibious dock landing ship USS Ashland (LSD 48) and amphibious transport dock USS Green Bay (LPD 20), along with embarked 31st Marine Expeditionary Unit (MEU), conducted combined task force operations during Talisman Sabre 2015 in the Northern Territory of Australia, completed certification exercises in the Northern Marianas Islands and provided disaster relief to Saipan after Typhoon Soudelor. "I can't say enough about how well this great crew responded to get BHR ready for sea and to execute our mission in the U.S. 7th Fleet," said Capt. Jeffrey Ward, Bonhomme Richard’s commanding officer. "The hard work, dedication and commitment to duty of these outstanding young Sailors made this a successful patrol." Throughout the patrol, Bonhomme Richard, Green Bay, Ashland and the 31st MEU worked hand-in-hand not only with each other, but also with foreign militaries. During Talisman Sabre 2015 the U.S. military worked with members from the Royal Australian Navy, Australian Defense Force and members of the Japan Maritime-Self Defense Force. "Integrating the ARG and MEU with other countries and other government agencies is always an important step in our continued success in this region," said Capt. Marvin Thompson, commander, Amphibious Squadron 11. "This patrol clearly demonstrated our ability to respond, in a both a training environment and real world events." Ashland and the embarked 31st MEU in particular faced unique challenges during this patrol. After Typhoon Soudelor ripped through Saipan, Ashland and the 31st MEU distributed over 350,000 gallons of water, 255 pallets of supplies from the Red Cross, 47,000 meals and 16 Generators to communities in need of assistance. "One of our biggest accomplishments this patrol was being able bring fresh food, water and supplies to Saipan after Typhoon Soudelor," said Cmdr. Daniel P. Duhan, Ashland's commanding officer. "Disaster Relief missions are some of the most humbling and rewarding missions we participate in. I’m proud of all the Sailors and Marines that were able to lend a hand to those that needed our help." 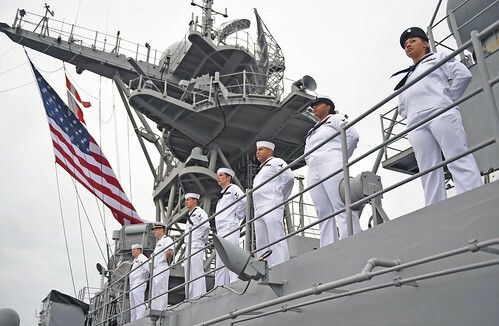 The Bonhomme Richard also held a change of command ceremony Aug. 29 for Expeditionary Strike Group Seven, where Rear Adm. Hugh Wetherald turned over with Rear Adm. John Nowell in Okinawa, Japan. The Bonhomme Richard ARG is forward-deployed to Sasebo, Japan, and under the tactical command of embarked Amphibious Squadron 11 and reports to Expeditionary Strike Group Seven, based in Okinawa.